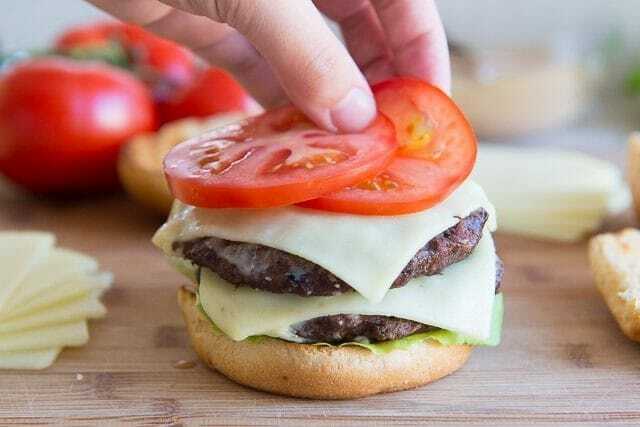 These Homemade Burgers have two grilled beef patties layered up with all the classic burger fixings and a secret sauce on top. It’s perfect for summer grilling! 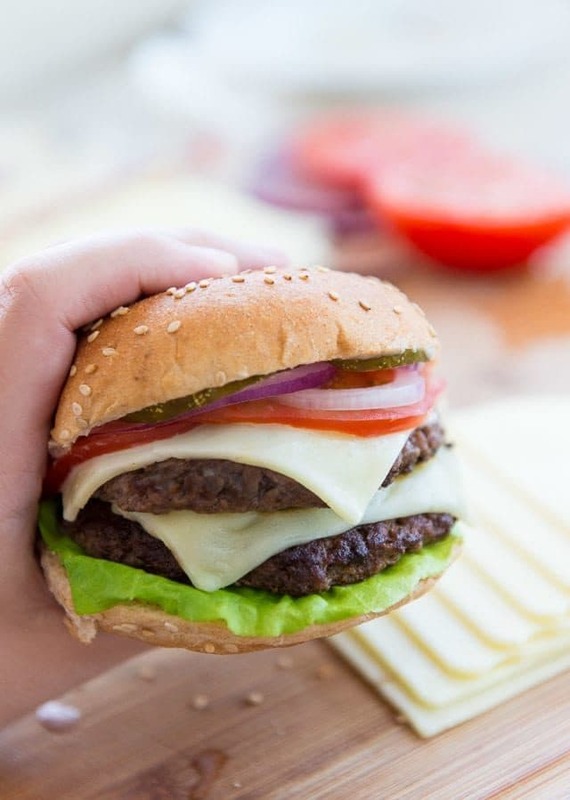 The best part about making burgers at home is you can use high quality beef and ingredients, and get that perfect sear on the outside, fresh off the grill. In my opinion, the best burgers are made on the grill. You just can’t beat that caramelization and char that happens with that high heat. But, if you don’t have access to a grill, a good alternative is cooking them in a super hot cast-iron skillet on the stove. You’ll be surprised by how fantastic a cast-iron cooked burger can be too. I do this when it’s chilly outside and too cold to grill. 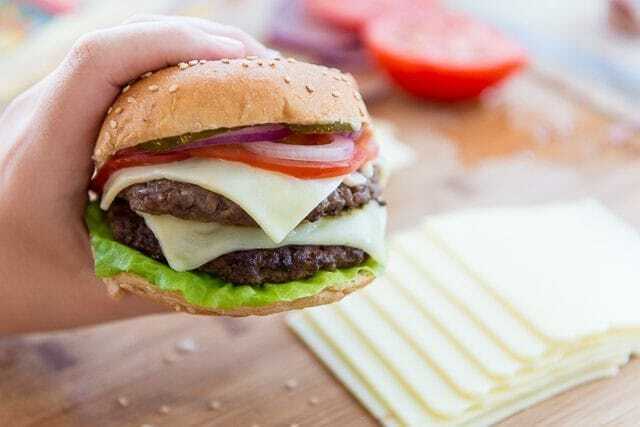 There are a million variations for how to make a burger, with different kinds of cheese, condiments, and ingredients. But this right here is what I think of as a classic burger. 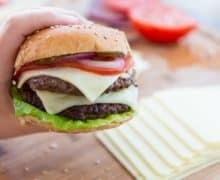 It’s the burger I make when I get a craving, and want that balance of beef, cheese, tomatoes, onion, pickles, and a secret burger sauce that’s reminiscent of Shake Shack, my favorite burger chain. 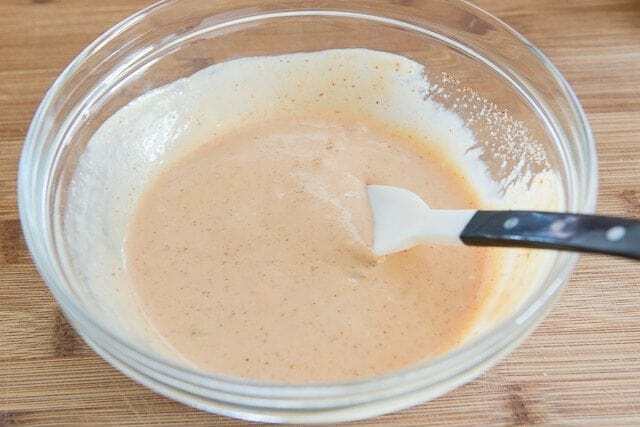 To get started, make the burger sauce so it’s ready when the burgers are finished cooking. It’s a mixture of mayonnaise, ketchup, Dijon mustard, pickle juice, garlic powder, onion powder, and cayenne pepper. Stir it all together to combine. Now it’s time to grill! While some people will grill the buns and burgers at the same time, I like to knock the buns out first, so I can focus on nailing the cook of the burgers. They only need a minute or two to toast. Next cook eight 4-oz beef patties for a couple minutes on each side, then put one slice of your favorite cheese on each one just before taking the patties off the grill. That way they melt just a little bit. I like American cheese, Cheddar, Muenster, Provolone, and Swiss for burgers. Anything melty! To assemble the burgers, place a leaf or two of butter lettuce on a toasted bun. Then stack up two of the beef and cheese patties. Add a few slices of tomato. Then add red onion, and bread and butter pickles. 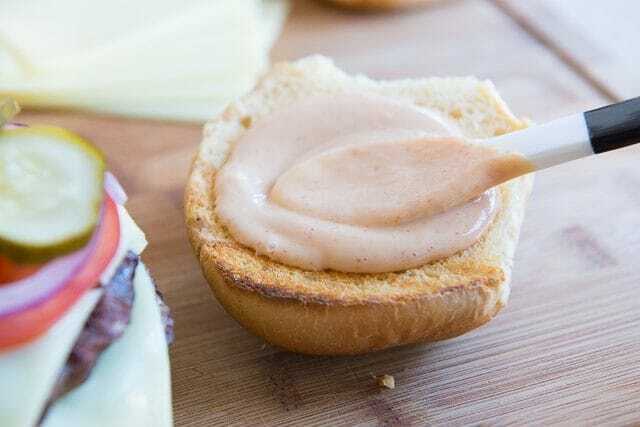 Spread a spoonful of the burger sauce on the inside of the top bun. Then put the top on. Enjoy all summer long! Happy grilling, my friends. 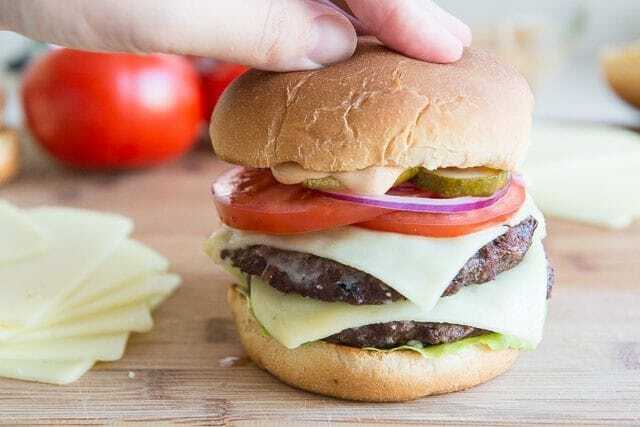 These Homemade Burgers have two grilled beef patties layered up with all the classic burger fixings and a secret sauce on top. It's perfect for summer grilling! Heat the grill to 600 degrees F.
In the meantime, make the burger sauce by stirring all of the sauce ingredients together until combined. Set aside. 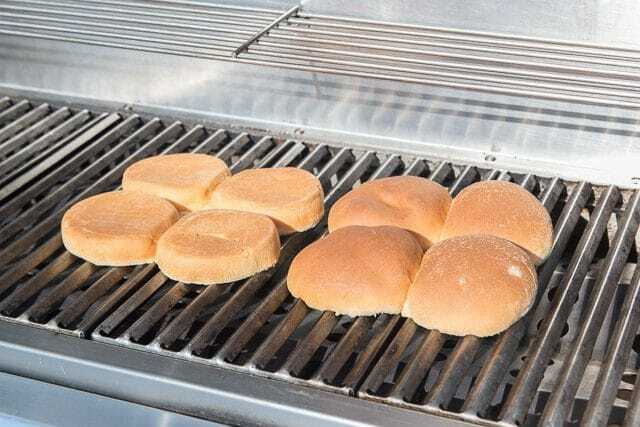 If desired, toast the buns directly on the grill, for about 1 minute, until toasted. Remove to a tray. Season both sides of the beef patties with salt and pepper, then cook on the grill for about 2-3 minutes on each side, until browned on the edges and cooked through to your desired doneness. 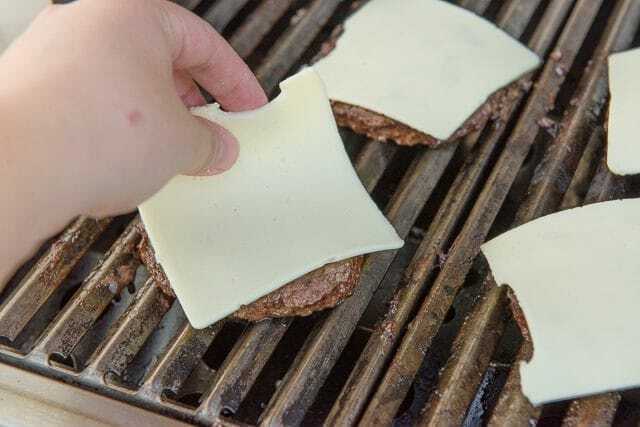 Place one slice of cheese on each patty just before removing from the grill, to melt slightly. Remove the beef from the grill, then allow to rest for a couple minutes. 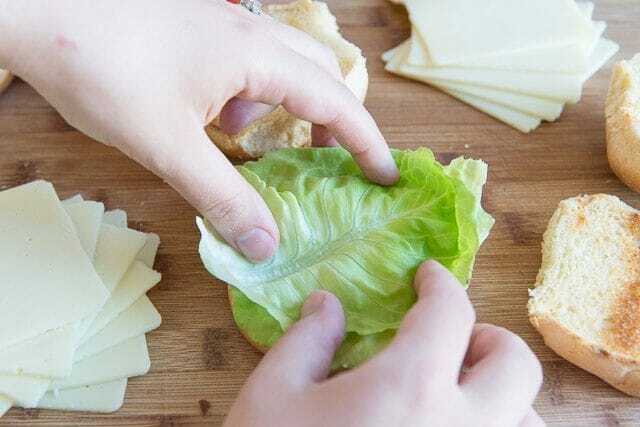 To assemble the burgers, place a leaf of lettuce on the bottom bun to prevent the bun from getting soggy. 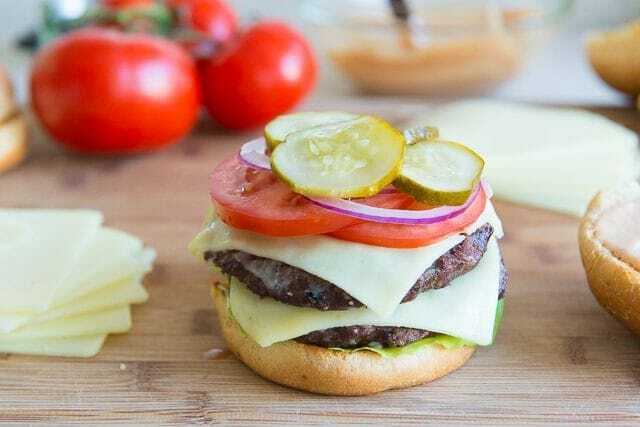 Then place two cheese beef patties on top, then the tomato, red onion, and pickles. 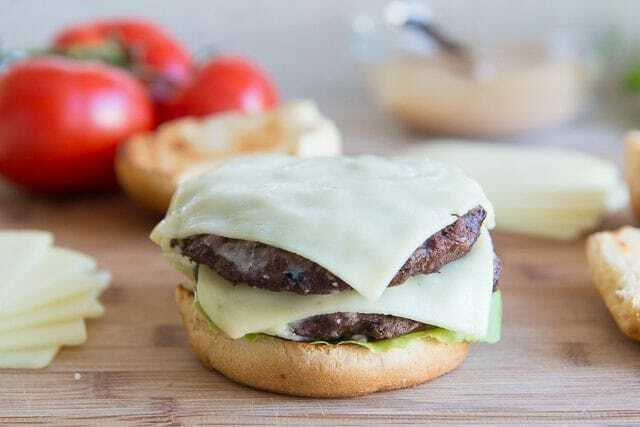 Spread the inside of the top bun with a tablespoon or more of burger sauce, then place on top of the burgers. Enjoy! Land O’Lakes white American slices are ALWAYS my go-to for burgers! So delicious and gooey. 🙂 I usually do my burgers in my gigantic Lodge skillet but yours look pretty tasty. And I’m a burger sauce girl too. The sauce was awesome! I felt like I was eating an in-and-out burger at home, and I made the buns from scratch, too. Amazing burger…thank you for that sauce recipe! This is how to do a burger.